How can we better understand 1st Peter chapter 1? Read below what I have suggested. Perhaps you could add how you think this Bible study could be improved. First Peter chapter 1 was written by a man of God who knew full well what the church needed to learn and to hear. He went from being a disciple that denied Christ 3 times to one that boldly proclaimed the gospel to all that would hear, regardless of the consequences, which often resulted in beatings and being cast into jail. I am excited to dive into this chapter and find ways in which we can better understand the Word of God and specifically the first chapter of 1st Peter. It is clear that Peter is writing to the Jews who are dispersed (called the Dispersion) throughout the Roman Empire. He calls them the elect, meaning that God has elected to save those who trust in Christ. This election was like God was the only One Who voted. The final vote was God 1, everyone else 0. That’s because our election was “according to the foreknowledge of God the Father.” The word used for “foreknowledge” is “prognosis” which means “with forethought” or “by pre-arrangement” so we are destined to be saved with God’s forethought, by pre-arrangement even before we were born. You can read more about this in Ephesians chapter 1. Who do you think these elect were? Do you consider yourself an elect one? What does it mean to have peace and grace multiplied? Is our Faith Tested by Trials? It is true that a faith that had not been tested cannot be trusted so what does Peter mean that the “genuineness of [our] faith” will be “tested by fire?” What if we fail this test? Can we fail it? Does Peter mean that “obtaining the outcome of [our] faith” and “the salvation of [our] souls” depends on whether we pass or fail the test? What does he mean by the genuineness of our faith? Can we fake it? Angels Desire to Look into? What does Peter mean by saying that the prophets who prophesied about Christ were “serving not themselves but you” and me? Who revealed this to the prophets that they were not serving themselves but us? What is it that the angels long to look into? Why are they curious about it, whatever it is? What things do they long to look into? How can we possibly be holy when we all fall short of the glory of God (Rom 3:23)? What does it mean to conduct ourselves with fear? Why does Peter say we’re to conduct ourselves “with fear throughout the time of [our] exile?” What exile is he writing about? What action are we to prepare our minds for? In what way was the Lamb of God foreknown before the foundation of the world? How can this be foreknown even before there was a man on the earth to sin? Did God know ahead of time that a spotless, blemish free lamb sacrifice would be necessary? Was it because of our nature? How has it been made manifest in these last times…and for our sake? I thought we were purified by Christ’s sacrifice (2 Cor 5:21) so how can our souls be purified by obedience? How can we love with a pure heart since “The heart is deceitful above all things, and desperately sick; who can understand it” (Jer 17:9)? What is this imperishable seed? Is it the Holy Spirit? Is this “good news that was preached to” us the gospel? I hope you gain as much as I did in studying this first chapter of 1st Peter. There is so much there and in fact, every verse and chapter contain so much that you can spend years in one book giving messages and providing Bible studies. That’s how powerful and compact the Word of God is. There is depth in an economy of even a few verses. Maybe you can come up with your own questions or even better ones than I came up with for this Bible study. Either way, it is hoped that it will help you grow in the grace and knowledge of the King of kings and Lord of lords, Jesus Christ. More reading: What Does the Bible Teach About Free Will and Predestination? What delightful words of encouragement this article with Scriptures provided! 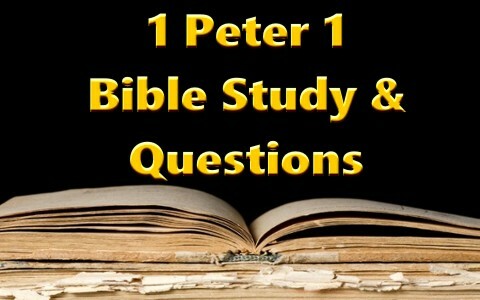 You raised thought-provoking questions that I’ve decided to make 1 Peter 1 part of my Bible study for the 1st. week of February. Have this page book-marked so I can answer for myself all the questions. You giving us other parts of God’s Word will definitely help with that. Thanks! Hoping to hear YOUR answers to these questions as time goes on, Pastor Jack. God’s wonderful blessings & His sustaining graces be showered upon you, Pastor Jack, your family, & your ministry!! Patty…you are, as usual, more kind to me than I deserve. I have “book-marked” you in my heart my dear sister in Christ. Always the Barnabas. My computer crashed could you please send me an email so I may have your address again? Well done good and faithful servant, well done indeed. May God bless your family and you richly. Hello Pastor Jack! Thank you so much for your questions on 1 Peter, I was having trouble getting into chapter 1 until I read some of your questions and analysis on it. After a while, I started really getting into the groove of picking each verse apart. Thank you again!